For the first time various narrow gauge railways are recorded across the country. 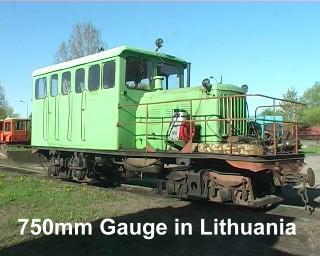 As the title suggests the historical standard for Russian narrow gauge was 750mm, and most of the systems reflect this. The footage was taken in May 2005. 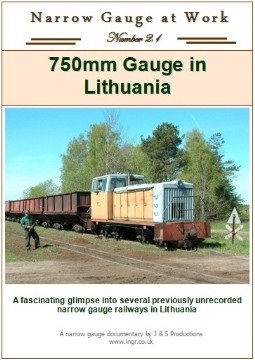 There are still up to 14 peat railways still active in the country, and this DVD visits several of the locations. The only surviving state narrow gauge system at Panevezys is slowly being reborn as a preserved/tourist line and most of this system is seen. 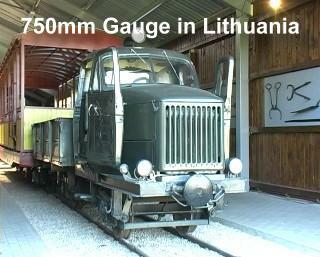 Also, an unusual railway serving a prison is filmed near Kaunas using an ESU type loco. 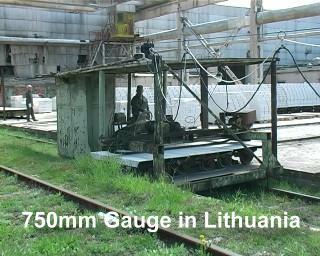 During the film various other locations are seen including several broad gauge industrial locations. 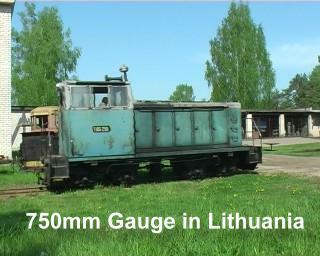 At Silute a large peat factory has up to 5 locos in use during the day. This example is a class TY6A BoBo loco. Near Gargzdai on the west coast, a concrete fabrication company uses a private broad gauge railway, and inside the works there is a stockyard which uses 750mm bogies to move the blocks from the ovens. An electically operated trolley moves the bogies from one end of the year to the other. 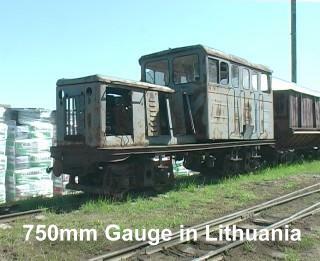 Waiting for overhaul, at Silutes a recent arrival from Kaliningrad was a railcar type ESU2A. After a 30 minute journey one of the locos at Silute runs round its empty train to back into a siding for loading. Later in the day another loco arrives off the moors with a full train. 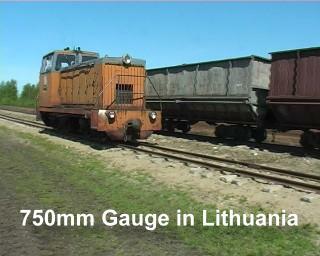 At Rekyva peatworks, outside the loco sheds this ESU2A railcar was present. Petrosiunai station is deceptive. 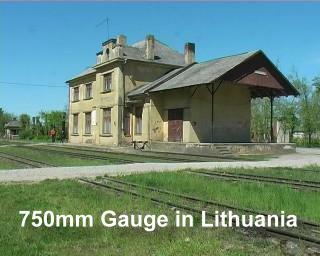 The associated state narrow gauge railway which was part of the Panevezys network was taken up long ago, but this station and trackwork has been retained as a momument to the railway. KP4 708 is in immaculate condition found plinthed outside the mainine station at Panevezys. TY2 139 with a short train waiting to depart from Panevezys station. Travelling through typical flat scenery to Anyksciai. 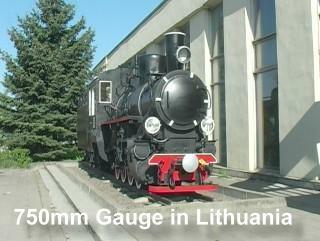 At Anyksciai a new museum now houses a collection of locos and rolling stock. The Panevezys line teminates near Rubikiai. Trains rarely venture this far and the loco carefully runs round its train with the tracks hidden in the long grass. Sulinkin peatworks has one of the longest main lines, with a run of up to 12km to get to the peat moors. Here crossing a minor road about 1km from the works. 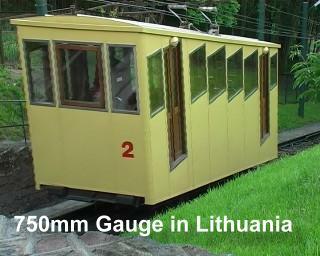 With a slight diversion from the 750mm gauge theme, at Kaunas there are two funicular railways, one of 1000mm gauge and one of 4ft gauge. At Ezerelis a small peatworks has two locos available for line work. TY6A 2501 is seen here at the works. A short line in use to serve a timber yard, transports flat wagons of timber to a nearby prison, seen here with the ESU loco leaving the prison.